Today's trends (as of this writing March 1, 2019) show brownish to darker stained products selling quite well in northern states, reds and browns in the prarie states (Texas, Oklahoma and others) and mountain regions. The popularity of greige and beige browns are seeing good demand along coastal areas or warmer regions that include Florida, Southern California and Arizona. Prominent grey colored hardwood floors have been strong the last five years. With hardwood floors strong trends usually last five years, then something else comes along or so it seems. This may also be true of heavy character European or French White Oak floors which everyone seems to sell if you're in a trendy market. It's now reaching it's five year mark and we're hearing the some unfavorable comments and opinions. Unfortunately some buyers are led to believe these same floors are actually made in Europe. Yes some are, but a very large proportion are manufactured in China. 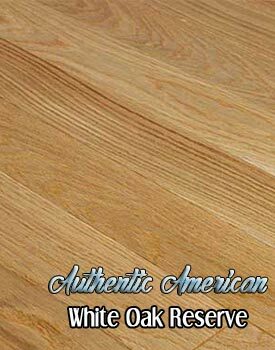 Our Authentic American White Oak Old Reserve offers a lighter character look compared to European or French Oaks. It’s success has proven many are turning away from the heavy character. The grey trend has evolved in the last twelve months. Nowadays browns, beige and a touch of grey are in demand. Greige is the new buzzword. It was only a matter of time before savvy homeowners began turning back to traditional hardwoods without trendy colors and other effects. 2017 and 2018 saw a renewed interest for reasons of becoming neutral and 'thinking ahead.' Better explained from some of our buying customers with comments like; "I don't want to regret my decision when it comes to selling my home" or "I'm not sure I want to go through the hassle of changing everything when grey goes out of style." Heavier hand scraped or contoured products, the rage that started around 2005 has taken a back seat in most areas, while a softer wire brushed ceruse effect seen mostly on White Oak (below) has been remarkably strong showing no effects of becoming “dated” like the others mentioned. Reclaimed hardwoods will always be welcomed but it’s popularity has never taken a front row seat. Most Popular Types of Hardwood? 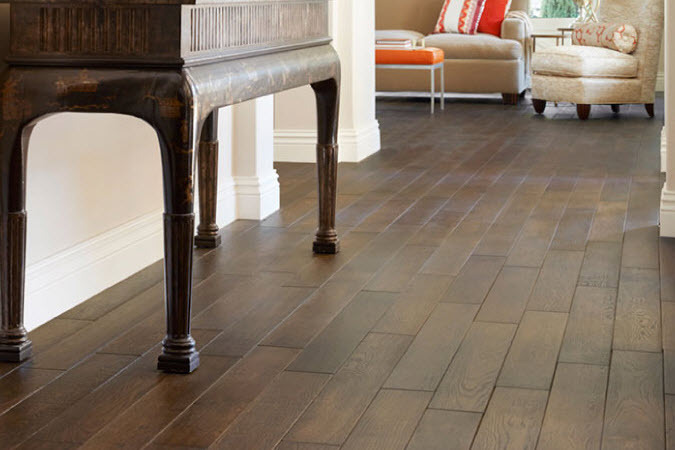 What hardwoods are people buying? Red oak remains strong in the sand and finish market. White Oak has taken on a renaissance with a large number of character graded prefinished hardwoods. 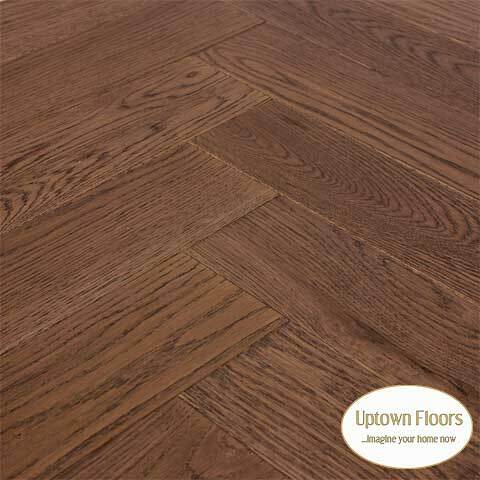 Hickory remains strong, while being used more for distressed type floors or offering the rustic choice. Lighter toned hardwoods in the likes of Maple and Birch have lost favor in their natural finished form, but are still desired for those seeking a cleaner contemporary look. Exotics have taken a sizable hit as has bamboo. 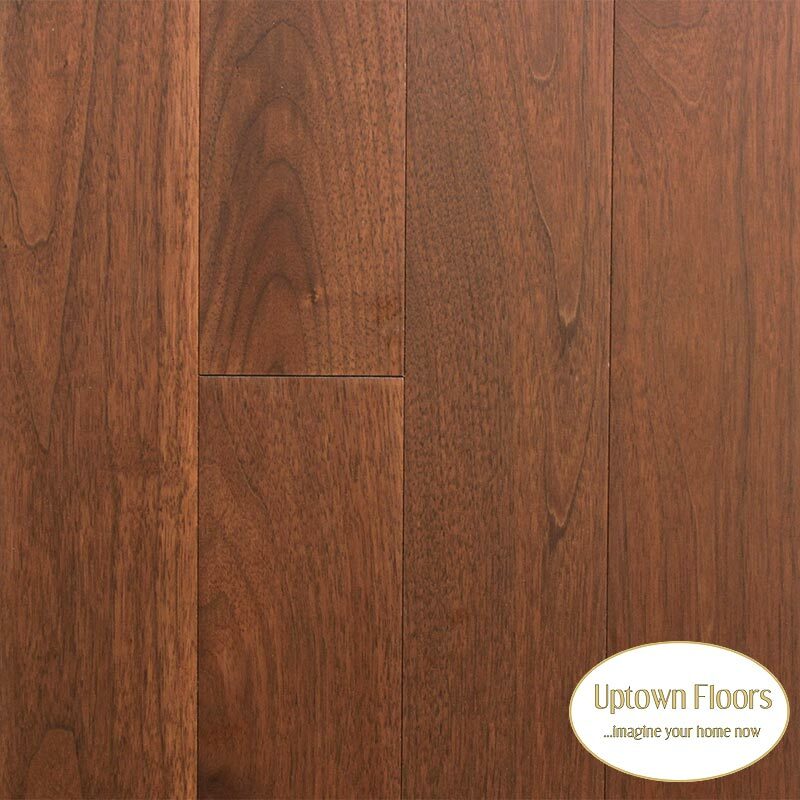 Brazilian Cherry, the rage of 10 and 15 years past, is seen less and now replaced by the trendier character grade hardwoods and a return to less pronounced natural colors without the heavy character. 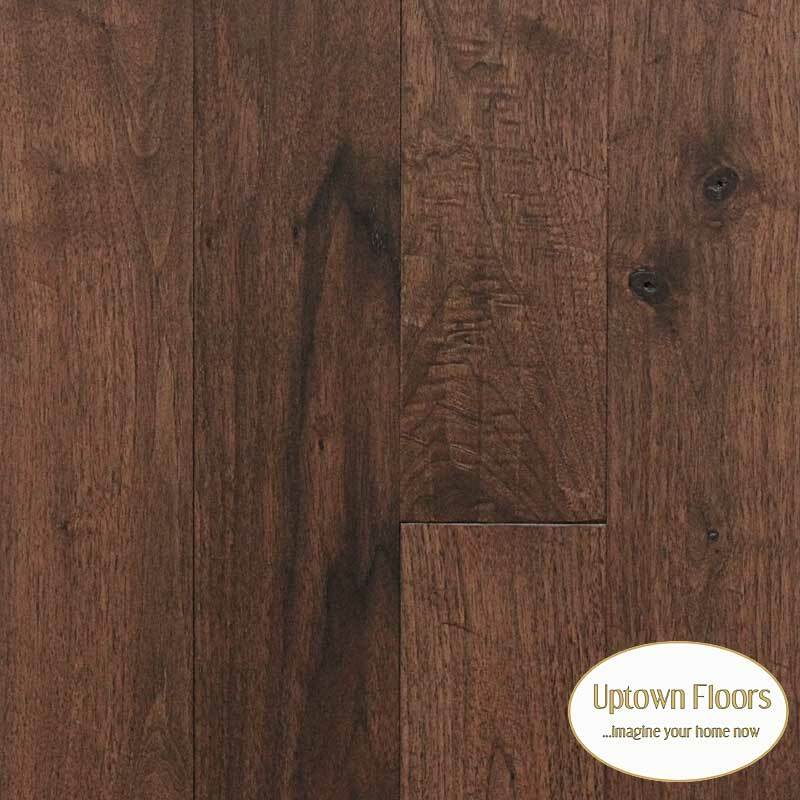 Factory prefinished wood flooring remains the selection of choice over actual on site installation and finishing. Reasons include faster completion schedules as the flooring is ready to be used immediately instead of waiting for finishes to cure. Additionally, prefinished warranties are very difficult to top traditional on site ones. The majority of manufacturers are now offering 25 and 50 year warranties. 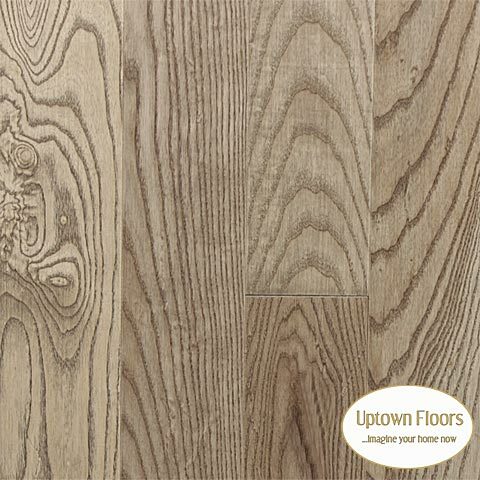 Wider plank flooring has seen a dramatic increase in use since the turn of the century. Some prefer their appearance as it can open up rooms that may otherwise feel or look smaller. 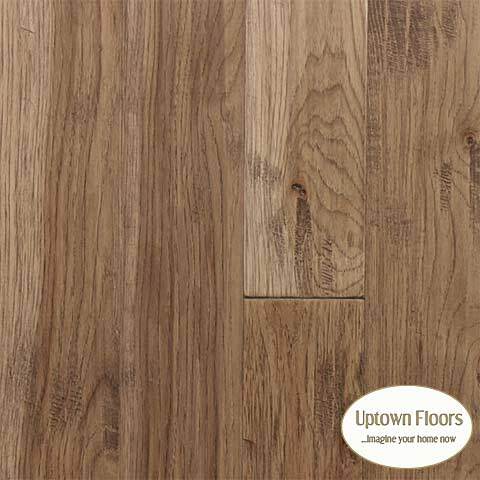 Along with wider plank hardwoods, longer length material is becoming more the norm. By way of explanation, I’ll offer an example. For one, they’re more traditional. Along with that the desire for wider plank appearances didn’t make sense with short pieces. I like to call it the checkerboard look (first image below). 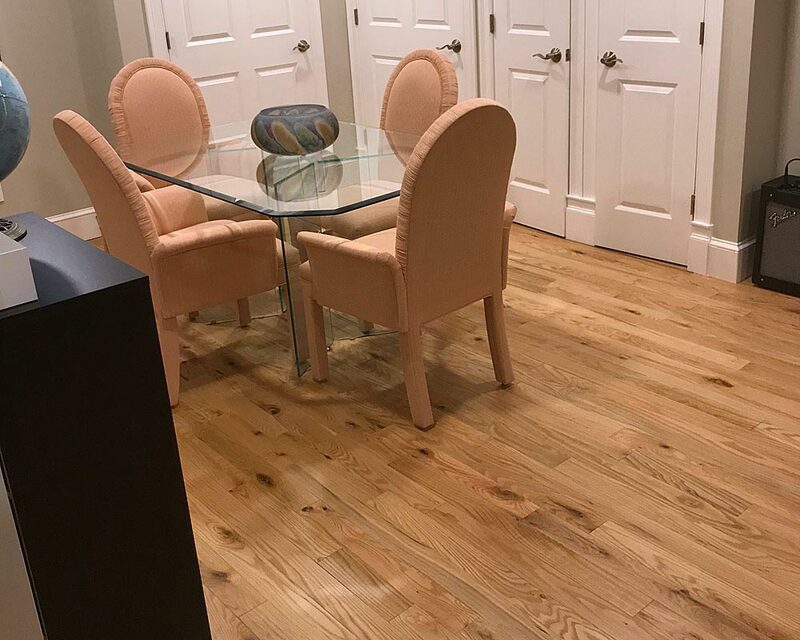 An installed 7 inch wide plank for example, looks exceptional with longer boards opposed to shorter ones due to the bevel or micro bevel on prefinished hardwoods. Plank width size has been increasing since five inch wide planks came on stream with Anderson and other prefinished manufacturers at the turn of the century. Over the most recent five years or going back to 2013 we’re seeing more 7 ½” planks, practically all imported from China. 7 ½" width for the most part, is a dead giveaway as very little of it is made in the USA. USA made commonly uses a 7 or 7 1/4" dimension. Random or mixed width is becoming more noticed and used. However, most manufacturers limit the consumer to their own specifications, namely 3 and five inch width. 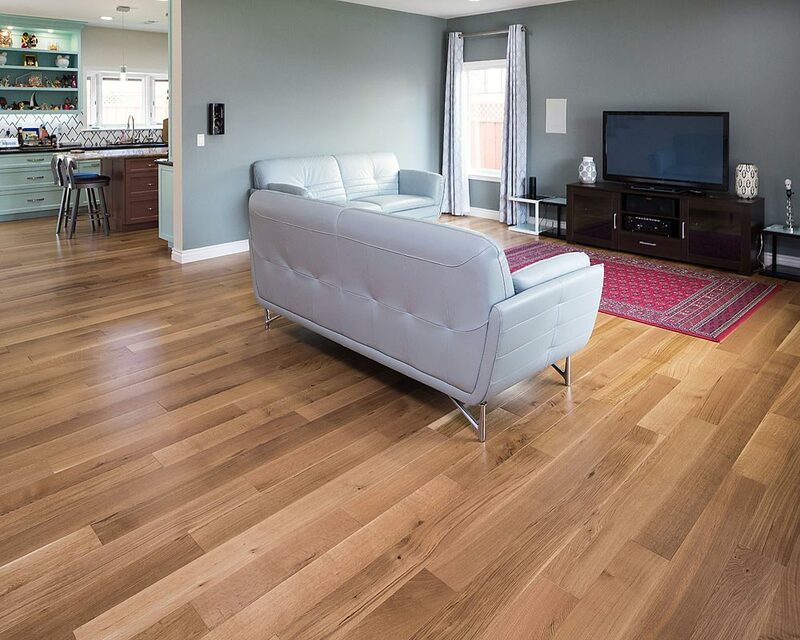 Our own engineered hardwoods offer any combination from 3 ¼ up to 8 ¼" width on Hickory, White & Red Oak, along with Walnut. 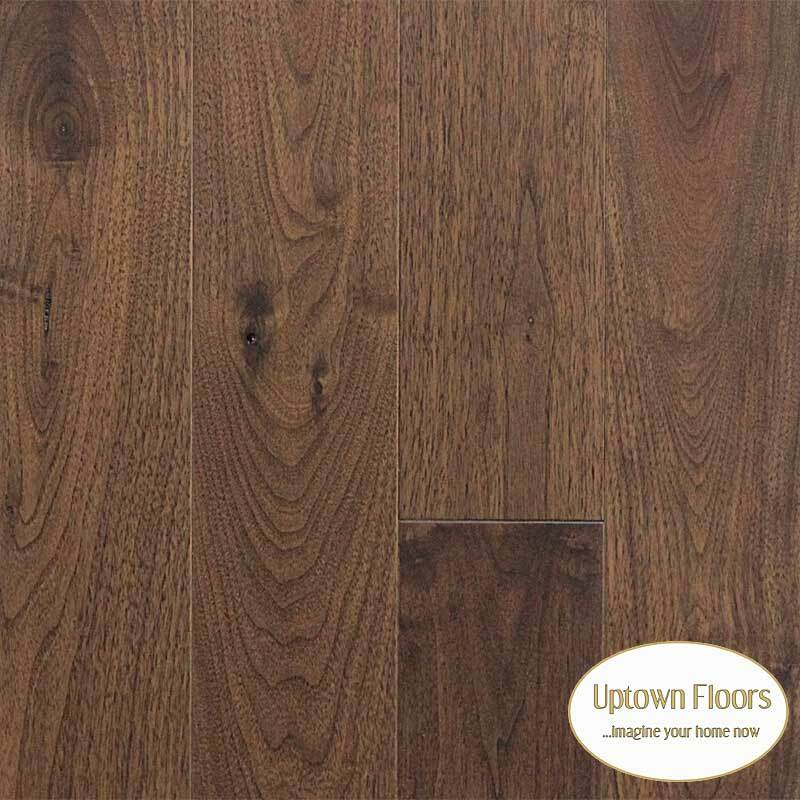 Today, low matte finishes (10-20%) are the norm with mid to higher end floors, but satin (30-40 % gloss level) remains constant seen in big box and primary carpet stores. Natural Oil Finishes? Good or Bad? On the higher end and those seeking environmentally friendly choices, natural oil finishes have been gaining popularity, but do have their own set of pros and cons. These finishes contain little if any VOC's and are much easier to repair. However, they can be a maintenance headache for some and premature color wear in high traffic areas can be a reality. Additionally, for those that obsess with perfection, water and grease spots can be problematic. 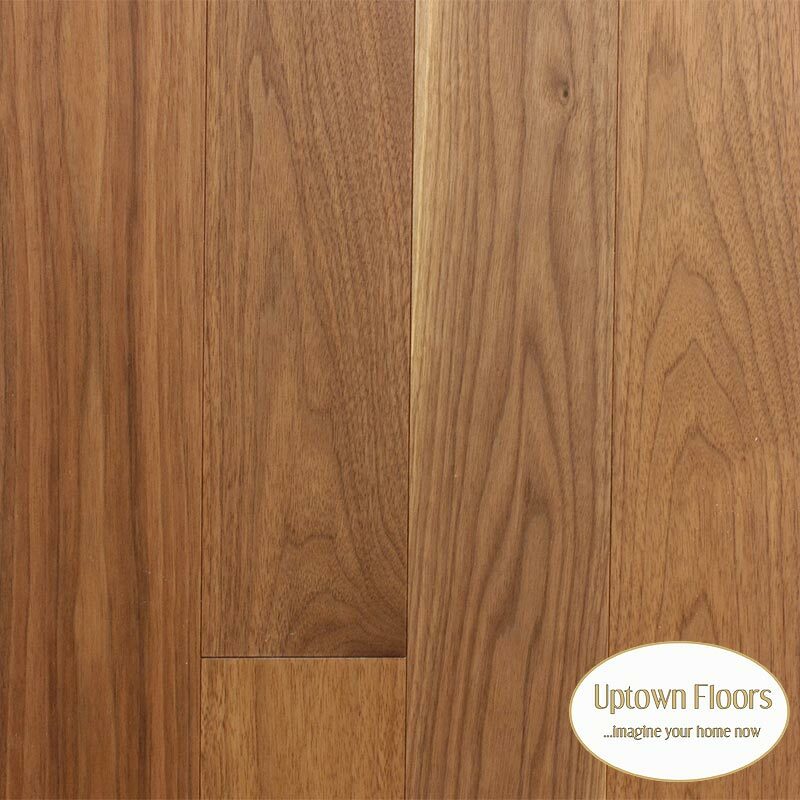 Ideally, these finishes are suited more for those that have professionals maintain their floors. Or if you have plenty of time to look after them yourself; not always an easy task. It's not always about hardness. The video below explains what many do not realize and may never know until it's too late. 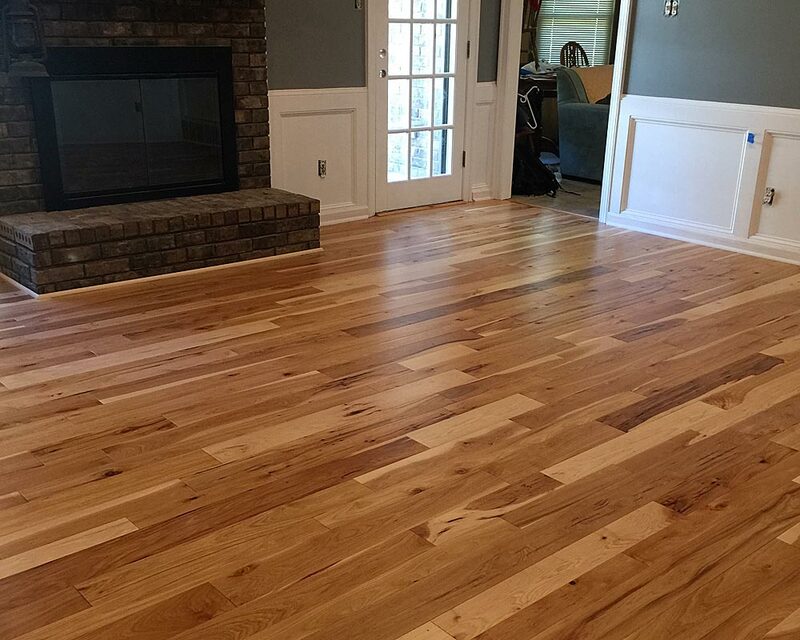 What Areas Of The Home Are Hardwoods Being Installed? Of the many floors installed today, areas of use have expanded over the years. 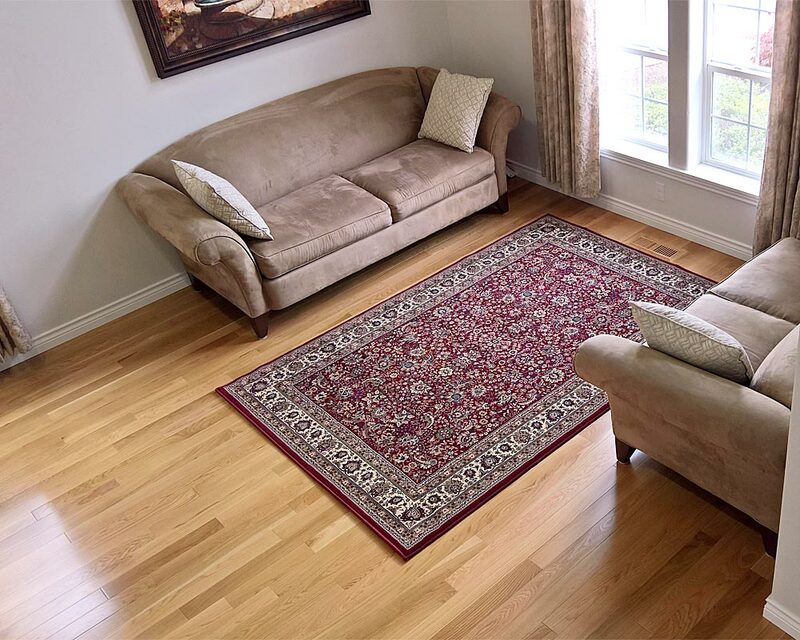 More common areas used for new flooring today include; foyers, great, and dining rooms, dens, libraries, home offices, and hallways leading to bedrooms. Kitchens and powder rooms fall right behind while bedrooms are often preferred for carpeting. Kitchens? Yes. Maintained properly, wood flooring in kitchens play a significant role. However, sheet vinyl, ceramic tile, or stone lead by a large margin as the floor covering of choice. 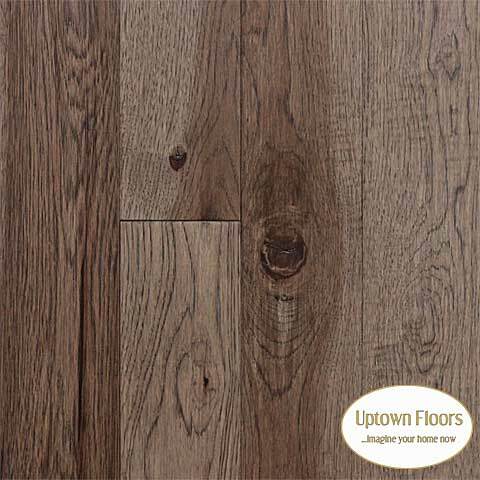 What Hardwood Floor Types Should We Choose? I will have to leave this one up to you. If you haven't noticed, there are a myriad of choices and options these days, but solid 3/4" products are still the leading choice if you have a wood sub floor. 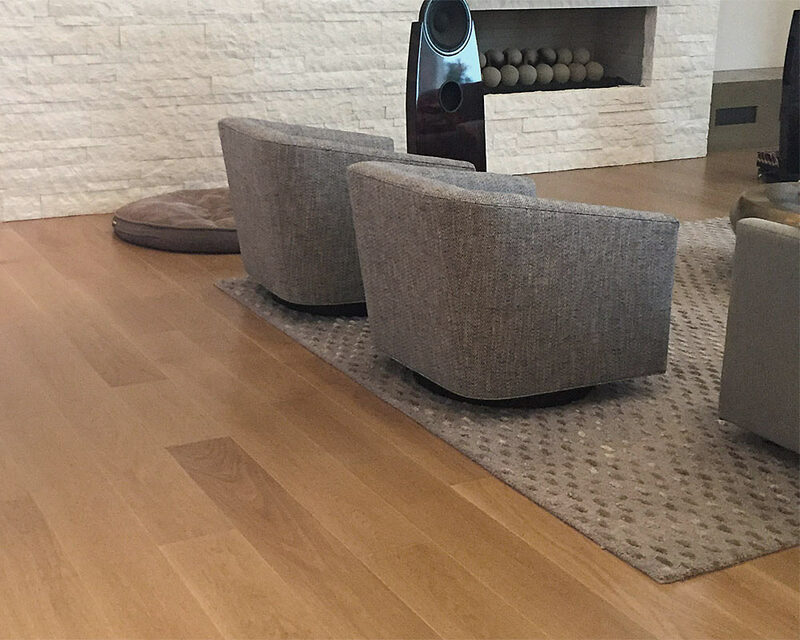 Keep in mind, the popularity of wide plank floors limits solid products as they do not perform well in most environments. This is why you’re probably hearing many salespeople today recommending engineered hardwoods. For those with concrete subfloors, engineered hardwoods should be considered in either a glue down application or floating installation. However, this does not rule out genuine solid wood flooring on concrete, but uses have fallen off dramatically in the last five years with the advent of thick veneer engineered floors including all of our Uptown hardwoods. When Should They Be Installed? Any hardwood flooring project should be scheduled very near the end of other work. The only other trades we would expect after the installation would be carpet installers, punch out trim, painting touch up guys, or wall paper hangers. It's highly suggested to cover all completed areas to protect against damage. For limited trade traffic, gray craft paper available at the big box stores can be used to cover. Tape? 3M quality the painter dudes use are safe on wood floors, but should not be left on for extended periods of time. Nor should they be exposed to direct sunlight. It's best not to tape to the floor but to the baseboards. Haven't we heard that before? Builders are notorious for not understanding when floors should be installed. Some reasons for their hurriedness include having the painting and trim subcontractors finish everything at once instead of having to come back. There are other reasons I will never figure out. If your new hardwood floor is installed with other major work not completed, make it clear to them you want the flooring protected. Far too many times new floors get damaged so badly they need to be refinished before the remodeling work is completed. The best protection, besides having the work done at the proper time, is covering with 1/8" masonite board, while duct taping the seams or joints. Duct tape should not be affixed to the floor itself. These efforts will be meaningless if the masonite board and finished floor¹ itself is not squeaky clean. Another product gaining popularity is Ram Board. It doesn't stop there. Depending on how much other work is needed to complete the remodel and the amount of debris created, it may be necessary to remove the masonite every so often making sure nothing has traveled underneath that will damage the finished floor. Common sense dictates the areas should be swept often and debris cleaned up at least once per day. We're Near the Beach. Sand? Living near the beach, or in the desert, sand will always affect the performance of any flooring. Attention to care and maintenance should be given priority. Newer high tech finishes will help handle the everyday wear, but not the inevitable scratching. 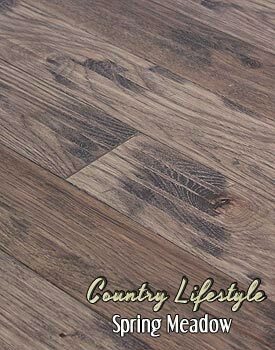 Lighter browns, and greige brushed hardwoods that help camouflage minor issues when it comes to sand are extremely popular in this scenario. Solid wide plank products will be more susceptible to adverse reactions relating to high moisture levels, but some types are less prone than others. 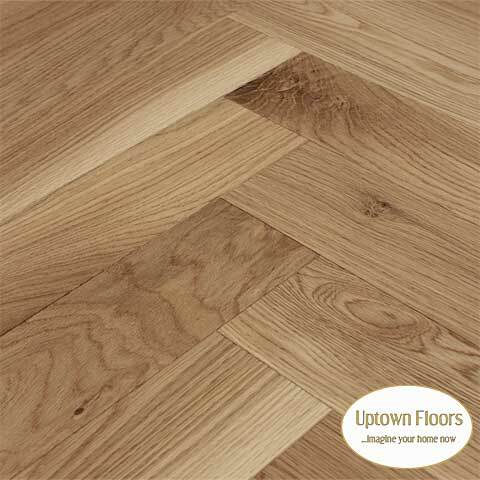 Engineered or rift and quarter sawn hardwoods will offer a safer alternative if in doubt. 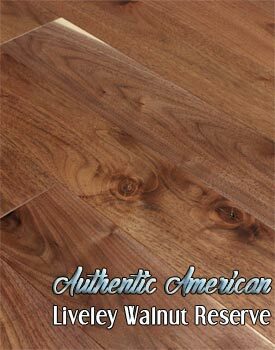 Although considered a soft hardwood, Walnut has always been the choice for those seeking an unmistakable rich grain appearance. Taken care of properly Walnut can be treasured for decades. 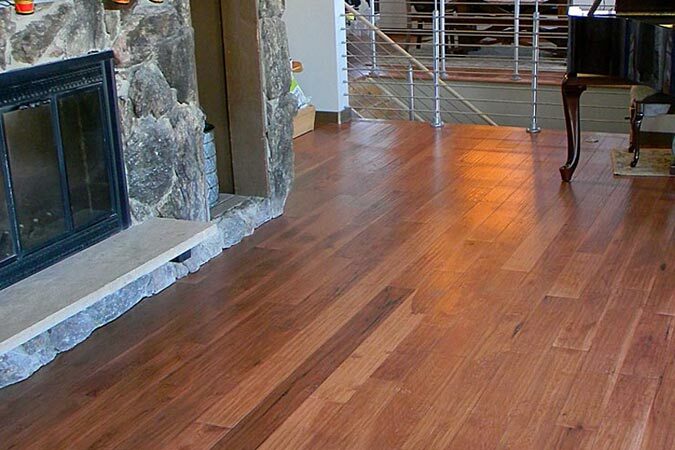 It is also one of the most stable hardwoods when it comes to radiant in floor heating. View our character and clear Walnuts below. Looking for a color you can’t find elsewhere? You could have it done the old fashioned way by calling in a crew to install an unfinished hardwood, stain and finish, but that sometimes doesn’t get the right results. Not to mention the time and inconvenience involved. Herringbone or Chevron designs are making a comeback. Actually chevron never made a real impact in the states as herringbone has in the past. It’s different and unique; something decorators go goo goo over. All Uptown hardwoods are offered in these layouts. 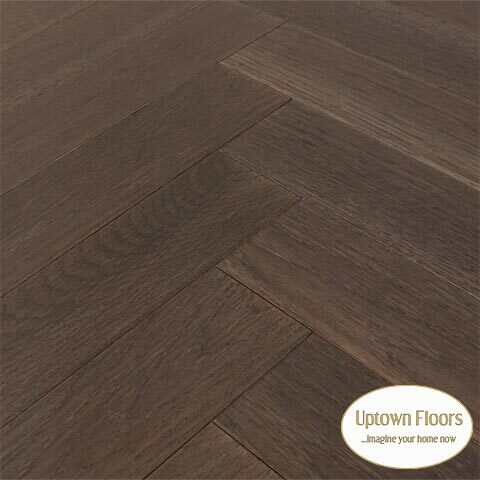 Unfinished floors or those that are sanded and finished in place are still popular for those that prefer custom coloring done on the site, or finished natural. The number of these applications has declined over the years due to the increased completion time compared to prefinished floors. 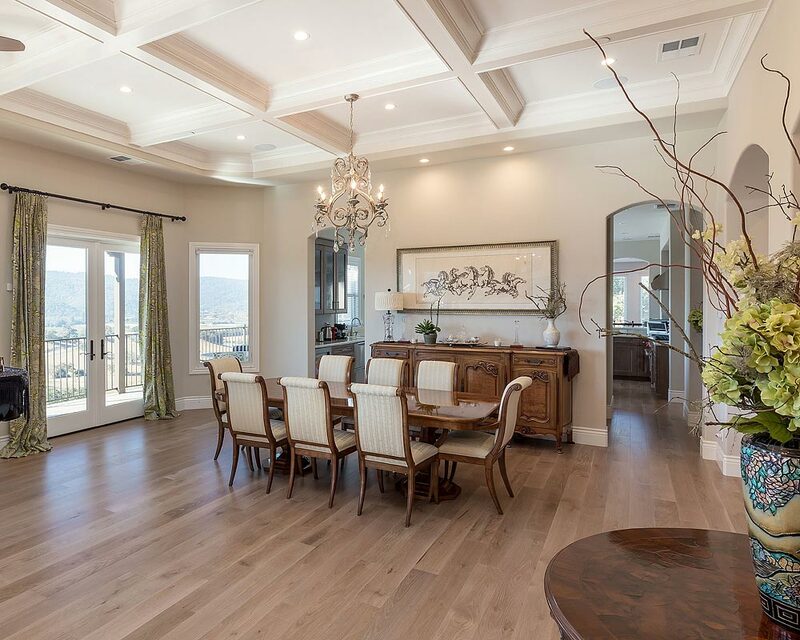 Unfortunately with many site finished floors, buyers are limited to using solid hardwood if the preference is plank flooring over four and five inch widths. 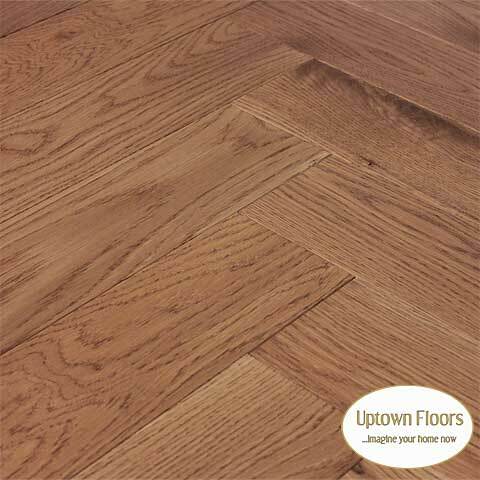 However, engineered is beginning to replace the use of solid hardwoods for reasons of better stability. 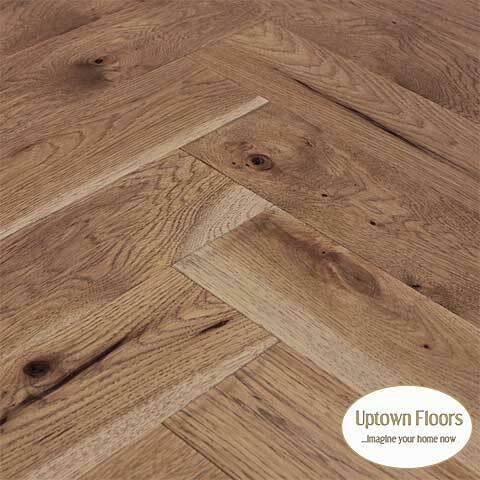 If you’ve been looking at wider plank floors you’ve probably been steered in the direction of the numerous engineered hardwoods displayed in flooring showrooms today. One benefit with unfinished floors includes the lack of bevels for those that don’t like the look. 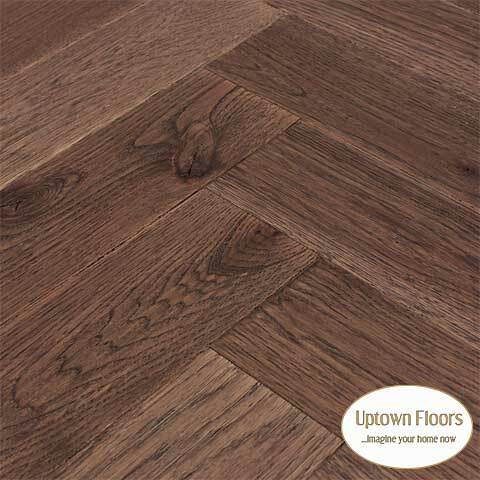 Once floors are completed, a flat uninterrupted appearance is seen and appears more like a traditional hardwood floor. 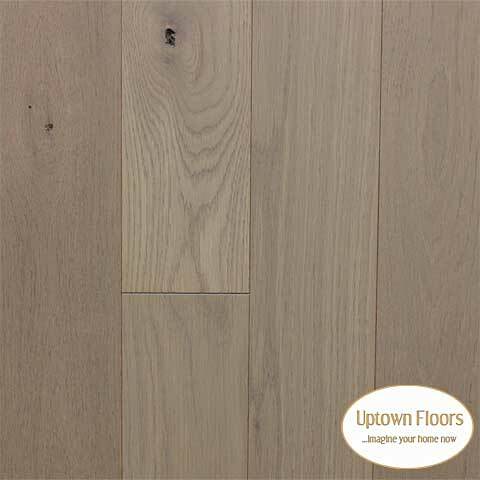 What many do not know is the availability of unfinished engineered hardwood. Your average flooring store doesn’t know they exist or don’t want the hassle of dealing with it. If they do, they’re likely to mention thin veneer engineered hardwoods because they don’t know of any higher quality products. ¹ Site finished floors need time to cure. Covering may not be an option. Consult a qualified professional with this one.